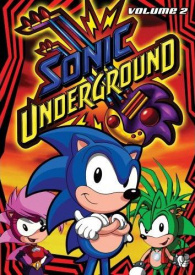 Sonic Underground - The Greatest Hits Volume 2 is a bonus disc contained in Shout! Factory's second DVD box set for the DiC animated series of the same name. A follow-up to the first music compilation on the previous DVD release, all eight songs are from episodes featured in the set it comes with. from "Six Is A Crowd"
from "Hedgehog In The Iron Mask"
from "The Jewel In The Crown"
from "No Hedgehog Is An Island"
This page was last edited on 13 April 2018, at 11:18.